"Egypt warned France on Wednesday that anything short of full cooperation in the case of the attempted sale by a Frenchman of hair believed to belong to the mummy of Ramses II could harm bilateral ties. . . . French police said on Wednesday they had arrested an unidentified man who had posted an ad on an Internet site offering a snip of hair, samples of embalming resin and bits of bandages he claimed had been taken from the mummy of Egypt's most famous pharaoh." See the above URL for comments on the matter made by Zahi Hawass. "A man has been arrested in France after advertising what he said was a lock of hair from Egypt's Pharaoh Ramses II for sale on the internet. The man said he had obtained the relic when his father worked on the pharaoh's mummy in France in the 1970s. Police seized small plastic sachets and boxes from the home of the man in the French Alpine town of Grenoble. The items have to be tested, but some experts said it was possible that the unnamed man's claims were true." This piece has details of the original advert, plus a comment by Christian Leblanc. Travel piece about the main sites around Aswan, and then Kom Ombo, Edfu and Esna, which includes brief details for all sites about the nature of the deities represented there: " First stop: the island Philae Temple of Isis the god of ends and beginnings, Osiris the god of the afterlife and their son Horus, a symbol of life as he ascended the throne and avenged the murder of his father at the hands of his uncle, Seth. Built as a burial place for Osiris - who was resurrected by Isis to become lord of the underworld - the Philae Temple has a strong Roman character with its colonnades and columns. Besides the Temple of Isis, Hadrian's Gate, and Temple of Hathor, it’s the Trajan kiosk - a graceful structure with beautiful capital — that’s an eye-stopper, rising majestically from the sand, attractively silhouetted against the blue of the river and sky. Replying to our questions about the Coptic crosses carved on columns in the hypostyle hall, Tamer told us that this part was once turned into a church." This is organized as a three-page article, but I found that the second page was blank - just click on the Next button to continue to the last page, or print the piece out in Print format. Short travel piece about the Giza plateau: "The pyramids are home to three Fourth Dynasty Pharaohs , Khufu, Khafre and Menkaure, and are guarded by the equally impressive Sphinx. This guardian sports the body of a lion and the head of Khafre but it no longer has a nose, an act of vandalism blamed variously on British soldiers in World War I or Napoleon’s troops in 1798. However, 18th-century drawings show the nose is already missing, pointing the finger towards the occupying Turks." For the first time, The Cummer Museum of Art & Gardens is selling tickets to their upcoming exhibit. But this exhibit is unlike any other that has been at the museum. Temples and Tombs: Treasures of Egyptian Art from The British Museum opens Dec. 22 and runs through March 18. . . . The museum is expecting record attendance and tickets are on sale now." Anyone looking for my Predynastic website at either of the two addresses above will find that it is no longer there, thanks to my hosting company who deleted it, together with my Near East prehistory site (was at www.neareast.historians.co.uk) and the Predynastic photo gallery at www.predynastic.cd2.com. I am working on putting them back up (in spite of the assurances from the hosting company, all attempts to upload the sites have so far failed). I am going to start again with the Predynastic photo gallery, so that is gone for good. Apologies to those of you who have asked me where the sites have gone. I'll post here when I have them back up and running. My Faiyum Prehistory site at www.faiyum.com and my Egyptology portal at www.egypt.cd2.com are still alive and kicking. Here's hoping that my hosting company don't decide to delete those ones too. The Asociación Andaluza de Egiptología is having its two-day conference (1600-2000 each day) on the 19th and 20th December 2006. Entrance is free for up to 150 attendees. See the above page for full details (in Spanish). Thanks to Ancient Egypt Magazine editor Bob Partridge for the information that the December 2006/January 2007 issue of “Ancient Egypt” magazine (published in the U.K.) is now available. This issue is also available as an electronic version which can be found at the web site. This may be useful for anyone with a broadband connection who may have difficulty in getting hold of a paper copy of the magazine, or who might want to see a copy before subscribing. The magazine’s Egypt Correspondent, Ayman Wahby Taher, brings the latest news from Egypt which includes the moving of the colossal statue of Rameses II from the centre of Cairo to the site of the new museum at Giza, and the restoration of the house that Howard Carter used when he first worked in Luxor. In the first of three articles, Denys Stocks investigates exactly how the ancient Egyptians cut and carved stone. Adopting a very hands-on approach, he made exact replicas of ancient tools and worked out how to use them. The results are impressive and important, for they show that using relatively simple technology, the ancient Egyptians could cut the hardest of stones. This first article looks at the earliest periods of Egyptian history, from around 4,500 BC to 3,050 BC. A Photo Feature on some of the magnificent objects now on display in Egypt’s newest museum. Christopher Naunton looks at the little known tomb of Harwa in the Theban necropolis. Currently being excavated by the Italian Archaeological Mission in Luxor, this remarkable and important tomb of the Twenty-fifth Dynasty is at last revealing its secrets. Writer and Archaeologist. Mary Chubb, who worked for the Egypt Exploration Society, worked for a while in the city of Akhenaten at Tell el Amarna. Elisabeth Griesman tells the story of how she managed to get there and how she was involved closely in the excavations at the site. In the last of a series of six articles, Renee Friedman explains the great importance of the site of Hierakonpolis and how the finds made there over many seasons of work, and their post-excavation study and analysis, have added greatly to our knowledge of ancient Egyptian history. For younger readers: This issue Hilary Wilson looks at baskets. Mountains of Pharaoh, by Zahi Hawass. The British Museum: Masterpieces of Ancient Egypt, by Nigel Strudwick. Chronicle of the Pharaohs, by Peter Clayton. Chronicle of the Queens of Egypt, by Joyce Tyldesley. Egyptian Mummies: Radiological Atlas of the Collection in the National Museum of Antiquities in Leiden, by Maaten Raven and Wybren K. Taconis. Magic in ancient Egypt, by Geraldine Pinch. An ancient Egyptian Herbal, by Lise Manniche. Death and salvation on Ancient Egypt, by Jan Assmann. The Treasures of Tutankhamun, by Jaromir Malek. Rescuing the Past: The cultural heritage Crusade, by Jonathan Tokley. Tutankhamun death revisited. All that glitters . . . Thanks to Nicole Hansen from Glyphdoctors for the above link and information. You will need to register for this very useful site (free) if you have not already done so. Nicole has contacted Dr Ashraf Selim who has clarified some details from the news postings that have been finding their way into newspapers and onto websites over the last few days. In Nicole's words: "When I asked the doctor (Ashraf Selim) about the report of gold in Tut's knee wound it drew a complete blank. No truth to it and he hadn't even heard this rumor. It appeared that some resin from the embalming had entered the womb but if there had been gold there it would have been very obvious on the scan. Add that to the reports of gold at the Ramesseum and gold coffins in KV63 and it makes one very wary about any such report of gold being found. It's actually quite rare to find gold during excavations these days.In any case, most of what the doctor talked about was already in the report on Zahi's Web site. I got the impression they learned a lot more about how Howard Carter mishandled the mummy than anything else." For the rest of Nicole's post, together with the rest of the discussion, see the above link. The organising committee of Current Research in Egyptology (CRE) VIII have announced the second call for papers. CRE VIII will take place at the University of Wales Swansea between Thursday 19th to Saturday 21st April 2007. Further information regarding the conference, including details of accomodation, can be found at the above website. Thanks to Thierry Benderitter from http://www.osirisnet.net/ for this news item. The son of one of the French scientists who took care of Ramesses II's mummy during its stay in France in 1976 is selling at auction what were apparently samples taken by his father: a lock of hair, but also fragments of embalming resin and of bandages coming from the king's mummy. "The aim of tonight’s lecture was to show that the undecorated tombs in the Valley of Kings are interesting and important. Scattered among the magnificent and beautiful tombs of the Pharaohs in the Valley of Kings there are a number of much smaller undecorated tombs. Although discovered at the turn of the centaury they have been virtually ignored both by those discovering them and by subsequent scholars and visitors. When Dr Ryan was a student back in 1983 he noticed them in the valley and pondered the archaeological problems they posed. These tombs must have belonged to some very important people in Egyptian society but we don’t know exactly who they are. Being undecorated there are no names preserved and the merger finds inside, due to a twist of fate, have not preserved the names of the occupants. Dr Ryan has been working in the small wadi that leads to Thothmosis IV and he started there in 1989." "A Londonderry man is set to cause a storm of controversy among academics with a new book claiming the Pyramids were built thousands of years later than currently believed. Major US non-fiction publisher Algora has now committed Emmet Sweeney's groundbreaking book, The Empire of Thebes, to print. The 51-year-old author, who has spent 20 years studying the mysteries of Egyptology and visiting ancient sites, also claims in his new book that many of the Pharoahs reigned a lot closer to the time of Christ than first thought. Research conducted by Mr Sweeney, a University of Ulster graduate from Malborough Street, found a number of similarities between Old Testament Biblical writings and those unearthed in Egypt, which were traditionally thought to have been much older. Mr Sweeney, who lectures at West University in Timisoara, Romania, has previously had his work published on the Arthurial legend and Stonehenge, as well as books on Egypt and Israel." A new exhibition is showing at the Musee de Tessee from the 24th November 2006 to the 1st April 2007 in Le Mans (France). It is entitled De sable et d'azur: la faïence dans la civilisation egyptienne. The above site offers the following brief summary "L'expostion présente les différentes techniques utilisées par lesartisants égyptiens pour la faïence. A travers 400 objets, le visiteurdécouvre les différentes facettes des usages de la faïence dans lacivilisation egyptienne." Opening times etc are available on the above page. "The number of International tourists arriving in Egypt jumped approx. 20% in the month of October, to reach a record total of 855,000 visitors. This number confirms the predictions of the Egyptian Minister of Tourism to end 2006 with a new record number, passing ahead of the already record year of 2005." It is so very typical that the KV63 website should have been updated whilst I was in Wales. I have checked it every day since the last update, and it really is one of those laws of life that new photos were added whilst I was away. Anyway, I'm back from Wales, my new PC is up and running, and the blog has been updated retrospectively again. Thanks to Kat Newkirk for keeping up the excellent work in forwarding me any news items that she found. I posted about this before, but prior to the website being functional. The website is now up and running with full details of the 10th International Congress of Egyptologist, which is scheduled to run from 22nd to 29th May 2008. The congress website is at the above address (click on the image to enter the site). The 10th Congress will be held at Rodos Palace Hotel & Convention Center on the island of Rhodes in Greece. In addition to the papers read, there will be poster sessions and the opportunity for the arrangement of special forums for work-groups. The Academic Committee is made up of the following individuals, in alphabetical order: John Baines (Oxford), Christopher J. Eyre (Liverpool), Nicholas Grimal (Paris), Zahi Hawass (Cairo), Yvan Koenig (Paris), Alan B. Lloyd (Swansea), Ludwig Morenz (Leipzig), Joachim Friedrich Quack (Heidelberg), Robert K. Ritner (Chicago), Alessandro Roccati (Rome), Pascal Vernus (Paris). The last Congress was held at Grenoble in September 2004. Opening at the Walters Museum in Baltimore on December 2nd 2006, the above exhibition will run until November 18th 2007: "Magic played an important role in religions of the ancient world. Amulets in particular were believed to posess great power to bring protection, health, luck, and even immortality through their images and symbols. This small exhibition will feature 46 amulets, scarabs, figurines, and ritual objects associated with this belief in the power of magic in ancient Egypt." Thanks to Thierry Benderitter for the news that a second tomb from El Amarna is now online on the Osirisnet website : The tomb of Ay, dating back to the time when he was still only a courtier. "BBC documentary re-enacts the discovery and resurrection of Egypt's greatest monuments by Giovanni Belzoni, a failed carnival strongman hired to move a large head of Ramses for the British consul. It's a bit of tenuous link between the two men of the title but Belzoni ends up becoming one of the greatest Egyptian explorers, assisted by his wife, Sarah." See the above page for brief additional details. "Dr. Selim, who yesterday presented a further analysis of CT scans taken last year to the Radiological Society of North America's conference in Chicago, was part of the first team to examine King Tut's mummy since 1978, when it was last X-rayed. They moved the mummy in its tray about 30 metres from its tomb to a truck parked outside, equipped with a CT (computed tomography) scanner. By scanning the entire body, the team of Egyptian, Swiss and Italian scientists concluded that the cause of King Tut's death was "most probably" a compound fracture to the lower part of left thigh bone. A compound fracture occurs when bone breaks through the skin, leaving the person vulnerable to infection or an embolism caused by globules of fat in the bloodstream. Their findings run counter to the popular belief that King Tut was murdered, either by his successor Aye, who was a powerful figure in the court of the young leader, or by some other scheming courtier." Otto Schaden has updated the KV63 website with the following short report: "Since the closing of KV10 and KV63 on July I6th I have been busy with reports to the SCA and a proposal for the 2007 season which will commence in February or March 2007. Our immediate plans will include continued conservation work on the coffins, exploration of the remaining storage jars, consolidation of various artifacts, and mending of ceramic vessels. The conservation work on the coffins will be a top priority, as we attempt to identify names and texts on the KV63 coffins." It looks as though he will not be updating the site again this year. The Bryn Mawr Classical Review 2006.11.39 has been updated with a review of Cleopatra. A Sourcebook. Oklahoma Series in Classical Culture, 31 by Prudence J. Jones: "In this work PJ sets out to address the question: Who was Cleopatra? Who is Cleopatra? This sourcebook does not provide an answer, but what it does do is to provide the reader with a foundation from which to pursue a variety of research projects into the nature of the infamous queen." See the above page for the full review by Susan Sorek, University of Lampeter. A very short review of one of the latest offerings from Zahi Hawass: "With its 300 color illustrations — including 30 huge foldouts — The Royal Tombs of Egypt: The Art of Thebes Revealed (Thames & Hudson, 315 pp. $65) is a kingly achievement itself. According to the publisher, the book is the first to reproduce in full the murals lining the walls of the royal resting places in the Valley of the Kings. With text by Egyptologist Zahi Hawass." Another review of the exhibition touring Australia, introducing the exhibition and describing individual artefacts: "Last year, 200,000 Australians visited the Louvre; after the Mona Lisa and the Venus de Milo, its Egyptian antiquities are the museum's most visited exhibits. The size and distinction of the Egyptian collection puts it among the world's most significant, and from now until late October next year, for the first time, an intriguing selection of these rare and precious objects is in temporary residence in Australia; until late February at the NGA, then in Adelaide and Perth. . . . Tanethep's black diorite sarcophagus is an extraordinary work of sculpture, sending echoes back into a place where time seems meaningless. Her face is immutable, a mask for the deep complexities of the world she knew and the afterlife she imagined, of which we, even now, have only partial glimpses, teased out and pieced together from the clues they so deliberately left behind." A paper recently presented on October 25, 2006, by independent researcher Judy Kay King at the Second International Congress for Young Egyptologists in Lisbon, Portugal, is now available at www.isisthesis.com/papers.htm. . . . . Entitled “Biosemiotics in Ancient Egyptian Texts: The Key Unlocking the Universal Secret of Sexuality and the Birth of the Limitless,” King’s paper explains the reproductive mystery that has been manipulated by biopower from ancient Egypt to the modern era." Regular visitors will have spotted that I failed to update the blog either yesteday or this morning. I am having technical difficulties with a dial-up connection in Wales, for which my apologies. I will be back in London on Monday and will update the blog again then. Hopefully my new PC will have arrived by then too! All the best to everyone, and kind regards. "Despite the inset of the rainy season in the American west cost city of Portland, Oregon, hundreds of people were queuing last week at the front gate of the Portland Art Museum to take an incredible journey with the Pharaohs through the afterlife. The street in front of the museum, which looks much like Park Avenue, was also packed with luxurious vehicles as the crème of Portland society flocked into the museum to attend the opening of The Quest for Immortality: Treasures of Ancient Egypt, the largest collection of antiquities ever loaned by Egypt for a North American exhibition. . . . The exhibition displays 107 artefacts illustrating the Pharaohs' dramatic voyage to the afterlife. Items were carefully selected from the collection of the Egyptian Museum in Cairo, the Luxor Museum and archaeological sites in Deir Al-Bahari on Luxor's west bank and Tanis in the Delta, where the intact royal burial of Psusennes I was discovered in the 1940s." "Washington University owns one of the world's most prized mummies, currently on display at the St. Louis Art Museum. Many in the university community would like to see her moved to campus. Prominent St. Louis banker and private collector, Charles Parsons, donated two mummies to the University in 1896. Both mummies have been on permanent loan to the St. Louis Art Museum since 2002. They were displayed at the University from August to December of 1999. Prior to this showing, they were in storage at the University. One of those is Pet-Menekh, a male mummy, from the 4th or 3rd century B.C.E., whose wrapped toes can be seen at the foot of the coffin. The female mummy, Henut-Wedjebu, from roughly 1391-1350 B.C.E., is held in much higher esteem." See the above page for the full story and a lovely photograph of one of the exhibits. Thanks to Carolin Johansson for pointing out that Jane Akshar has updated her blog with a little extra information about the new finds at the Ramesseum. She says that one of her cleaners who also works at the French excavation at the Ramesseum have "found some very beautiful coffin remains and some had gold on them". Hopefully something more will emerge soon. "Conservation groups today claimed a rare Egyptian-style cinema in Glasgow would be 'completely ruined' if a developer is allowed to convert it into flats. Govanhill Picture House, which opened in 1926, is one of only five cinemas in the world built in the unique Arabian fashion and is the only one of its kind in Scotland. But Hanison Estates, based in Cathcart, want to create a five-storey development of 43 flats at the site." The University of Illinois Veterinary Teaching Hospital has been examining the contents of mummy wrappings on behalf of Spurlock Museum, at the request of the museum's Director, Douglas Brewer: "The mummified bird of prey recently imaged at the UI veterinary school may end up as a gift from an alumnus to the university’s Spurlock Museum. The museum routinely checks potential gifts for authenticity, although it doesn’t normally use a veterinary hospital imaging lab to do so. . . . In the case of the bird mummy, the images from the session will help establish its authenticity, but also may tell researchers things about its age, origin, purpose and more. Brewer got one of his questions answered during the initial examination. From a microscope examination before the imaging session, he could tell there was a bird’s head inside. But he wondered if the linen wrappings contained anything else, perhaps a mouse to feed the hawk in the afterlife. He also wondered whether the wrappings contained a whole bird, or just the head with filler, a bundle of sticks or something else, below. The images from the veterinary hospital, both digital X-rays and a CT scan, revealed a whole bird in stunning detail, but no other items." Another lovely photo from the Arab Image Foundation on the Daily Star website: "Abdel-Halim Hafez and Mariam Fakhreldin share a romantic moment at the foot of the Giza pyramids as they star in the onscreen love story 'Hikayat Hob' directed by Helmi Haleem and released in January of 1959". 1- To increase and affluence the amount of cultural general knowledge of Naqada and Qus region and to increase and activate the concern with such important region and with such important subject and its concepts among the public. 2- To present an overview and to conclude the current state of discoveries, conservation and restoration research, practice, problems and the progress in conservation and in the related fields in the region. 3- To create a common understanding of the profession among those who are involved in the practical work around Naqada and Qus region and the different items of the subject and in the related fields around the world. 4-To create a dialogue among the local and international professionals, such as Egyptologists, Copticists, archaeologists, curators, art historians, conservators, legislators and architects with the exploration and design of different strategies and methods around the subject. 5- To agree proposals for defining standards for the study, research and development in the different items of the subject for Naqada and Qus region and for the related fields around the world. 6- Honoring of some names between those who contributed in the discoveries, registration, publication, restoration and conservation and the development works in the region. 7- to achieve an active involvement of the public in the integral process of Cultural Heritage and its preservation, to achieve the understanding, acceptance and thus the support of the public in the activities it generates and to encourage the public to support and participate in the preservation of their own Heritage. See the above page for the main themes. This is the entire bulletin on the SIS website: "The Egyptian Tutankhamen exhibition in the United States has yielded $60 over the past two years," said Secretary General of the Supreme Council of Antiquities (SCA) Dr Zahi Hawwas. He added that the exhibition will move from the city of Chicago in February to Philadelphia, Pennsylvania. He said the exhibition will be later held at several European countries, Japan and finally in Bahrain. Hawwas said the exhibition has an insurance premium of $650 million, the largest." It sounds like an Indiana Jones movie, but in fact this is the title of an article recommended by Jane Akshar (Luxor News Blog) who has seen it and in fact appears on it! It deals with the damage to temples in Egypt caused by rising ground water, and looks at some of the work being done to combat the problem. It is showing on Al Jazeera at the moment, in their English language slot. It is good to see the subject being taken up and publicized in this way. Thanks to Jane for again supplying a summary of the most recent lecture at the Mummification Museum on her Luxor News Blog. This week's lecture was about the activities of nineteenth century Egyptian antiquities enthusiast Luigi Vassalli, by Francesco Tiradritti. Here's a sample: "In 1863 Mariette sent Vassalli to Dra Abu el Naga to draw the coffins of the high priests of Montu, these have now been lost. He found the coffins of Yahotep and Kahmose and the golden fly’s necklace of Ahmose Nefertari. He would continue to excavate in that area and personally supervised the excavation. His manuscripts are not complete but he recorded tombs like 104 Amenemhet I of XII dynasty. There are many coffins which re now lost which were recorded by Vassalli. One inscription says ‘the man with the wig’ which would be a special title like a man with big nose. Another strange name sounded like Misship North Syrian. There were 4 coffins in the tomb 2 anthropoid and 2 rectangular. Tombs could have been used for more than one centaury." See Jane's site at the above address for her complete notes, including photographs. If anyone knows of a website which lists the programme for the Ninth International Egyptologists Conference, which was held in Grenoble in 2004, please could you email me? I've had a hunt around the web without success. I can get hold of hard copies of the programmes with abstracts, but it would be useful to see an online list. I have the reference to Nevine el-Aref's summary on the Al Ahram website, but a proper list of speakers and titles would be great. Frustratingly brief announcement, in its entirety, from the State Information Service: "The Egyptian-French archeological mission has discovered a Pharaonic cemetery inside the ancient Ramsis Temple in Luxor. The cemetery contains kitchens, ovens and a school for children. Secretary General of the Supreme Council for Antiquities (SCA) Zahi Hawwas said the grand cemetery was not royal but rather public." I am sure that more will be forthcoming. A comprehensive summary of the Amarna exhibition currently showing at UPenn: "The exhibition timeline starts before Tut's birth, and before Amarna was built, with excavated busts of the pharaohs from whom he was descended and of the many gods they worshipped. Its focus, though, is on Egypt's brief Amarna Period, circa 1353 to 1336 BCE, when Tut's presumed father, the pharaoh Akhenaten, tried to refashion Egyptian society after his vision. Seeking a place where no other gods were held sacred, Akhenaten moved the capital of the Egyptian kingdom from its traditional seat at Thebes to a spot on the eastern bank of the Nile River. There, he built the city now known as Amarna - and moved 20,000 people there - in about 12 years. Stone statues and reliefs at the heart of the exhibit reflect the changes Akhenaten imposed on Egyptian society. Trumpeting a religion that for the first time in recorded history relied on the belief in a single god, Akhenaten strove to turn his monotheistic subjects to the worship of the Aten - the sun disc. . . . The Penn Museum, which holds the world's third-largest collection of Egyptian artifacts, will host a series of lectures, tours and films during the exhibit's run. Also the curator of the national Tut exhibit, Silverman said he enjoyed putting together the Penn show because it allowed him to tell another detail of the story that didn't fit into the blockbuster, by bringing out pieces that Penn had been holding in storage. Some of the artifacts on display have never been viewed by the public before. Silverman said he thought visitors would appreciate the items - a comb, paintbrush, wine jug and basketry - that give a feeling of everyday life in Amarna." A factual description of a trip to Egypt (Cairo, Sinai and a Nile Cruise): "Only 4 percent to 4 percent of this vast desert country is inhabited with the majority of the people living in the fertile delta and the along the banks of the life-giving Nile. North of Aswan, the river runs wide, its current gentle and the water remarkably clean. From the deck of our boat, we drift past mud brick homes, men fishing, children swimming, laborers digging in the sugar cane fields, workers carrying baskets on their heads, and camels being ridden to market. Immediately beyond this lush, verdant strip stretches the merciless desert; the beige-colored mountains rise as a backdrop in undulating waves of heat. When we dock at the town of Kom Ombo, a friend and I wander the authentic Egyptian markets and bazaar (souk) where the locals shop. Gigantic blue tarps are used to create outdoor stands, each offering new and used items for sale. After a little shopping, we retire to our ship, where we watch bejeweled belly dancers and swirling Sufi dancers in colorful skirts who perform stunts while they spin in circles nonstop for an incredible 15 minutes without any signs of dizziness. Our sailing adventure ends at Luxor, but what a grand finale this town shows us! Luxor is the most significant and memorable of our town and temple visits -- for its tremendous array of tombs, temples, and statues make it the world's greatest outdoor museum." To coincide with the Louvre Egyptology exhibition currently showing in Australia, there is a profile about the current head of the Louvre, Henri Loyrette: "Little in Henri Loyrette's demeanour suggests an implacable revolutionary. Yet this affable 54-year-old Degas scholar has steamrolled resistance to shake up one of the most venerable institutions. In 2001 he took over the Louvre, the grandest cultural institution in France, a country that places enormous value on its culture as well as its institutions, and since then Loyrette has sped reform at a dizzying pace. The first thing he did was to wrest administrative control of the museum from the hegemonic French Ministry of Culture. Then he set about expanding its buildings, its public programs and its scholarly remit. His ambitions were high: to change the Louvre from a grand but reified presence into a questing international player. Opposition has faded as the Louvre has flourished. . . . The French have a long scholarly history in the Middle East. The first curator of Egyptology at the Louvre, Jean-Francois Champollion, who cracked the code of Egyptian hieroglyphics, established the department under royal decree in 1826. Another Frenchman, Auguste Mariette, set up the Cairo Museum. There is still a significant French scientific presence in Egypt: excavations at Saqqara, funded by the French Ministry of Culture, are headed by the Louvre's director of Egyptian antiquities, Christiane Ziegler." I liked the tone of this travel piece - not a long article, but the writer conveys some of the feel of a first visit to Egypt (Cairo, Aswan and Luxor): "Strangely, as I discover the next day, proximity and daylight don’t make the pyramids more impressive. You marvel at how they managed without cranes: the largest of the trio, the Great Pyramid of Cheops (or Khufu, as Ingrid has taught us he is more properly known), was constructed from 2m blocks of stone and took 100,000 workers to build, according to one estimate. You want to be overwhelmed. But the closer you get, the more you lose any sense of scale. It takes a trip to the Cairo Museum for the reality of Cheops’ megalomania to sink in. There, in a nondescript glass case, you can see all that remains of the treasures once buried in the Great Pyramid, a 7-inch statue of the king. You almost feel sorry for him." Thanks to the weekly EEF News Digest for the information that Juan Jose Castillos has posted a summary of the 2006 Scholars' Colloquium in Toronto online at the above address. The summary is available in English and Spanish: "On the 3 and 5 November 2006 the Society for the Study of Egyptian Antiquities of Toronto, Canada, organized another Scholars’ Colloquium in which egyptologists of several countries read papers dealing with their current research. . . . More than two hundred people attended this event which was open to students, scholars and also to the public interested in these subjects, and which for the first time had to be extended over two days by the number of speakers that were invited this year. As usual, I will provide here a Report on this meeting so that all those who may be interested in any of the subjects covered by the Colloquium will be able to have a basic idea of what was said, at least as I perceived it. For more details or clarifications, it is relatively easy to reach the speakers using the email listings provided by the International Association of Egyptologists." Thanks to Tor Hershman for sending me this video link - great fun. It is an alternative look at the story of the Amarna episode. There's nothing new in the story, but the way in which it is produced is very different - and as I said, great fun. You'll need to settle for a few minutes for this - Tor isn't mean with his time. A new exhibition, Objects for Eternity, Egyptian treasures from Antiquity, is opening today at the Allard Pierson Museum in Amsterdam (Netherlands), with items from the collection of Dutch collector W. Arnold Meijer: "Approximately one hundred and fifty objects from ancient Egypt will be on display in the exhibition Objects for Eternity at the Allard Pierson Museum. This exhibition will show how intensively and carefully the ancient Egyptians prepared for the eternity they believed was in store for every decent person. The Allard Pierson Museum will show these glorious treasures - supplemented by a few objects from its own rich Egyptian collection - on their path through time, answering questions such as: How were they made? For whom? And why...?" The exhibition runs from 17th November 2006 to 25th March 2007. "Nominations were whittled down by public votes to 77 last year. Then a panel of architectural experts, chaired by former Unesco chief Federico Mayor, shortened the list to 21. Interest has grown as Weber and his 10-member teams visit the 21 sites. Their final visit will be March 6 to New York's Statue of Liberty. In addition to the Statue of Liberty, Pyramids, Eiffel Tower, Taj Mahal and Machu Picchu, the finalists are the Acropolis; Turkey's Haghia Sophia; the Kremlin and St.Basil's Cathedral; the Colosseum; Germany's Neuschwanstein Castle; Stonehenge; Spain's Alhambra; the Great Wall; Japan's Kiyomizu Temple; the Sydney Opera House; Cambodia's Angkor; Timbuktu; Petra, Jordan; Brazil's Statue of Christ Redeemer; Easter Island; and Chichen Itza, Mexico." Picture of and brief caption re the Theodosius obelisk. The Theodosius obelisk was removed from Luxor by the Byzantine emperor Theodosius I in the late 4th century, and now stands in Istanbul's Hippodrome Square, in front of the Blue Mosque. At 19.5 meters in height, the obelisk is in fact incomplete, missing a section at the bottom. No-one appears to know when this was lost or what happened to it. Andrei Bodrov has recently reassembled his interesting project digital.egypt which displays panoramas of the Giza Plateau sites in a variety of different ways. This means that 99% of visitors should be able to view them (with combination of plugins: QuickTime / DevalVR / Flash / Director / Java). To see the panorama click on the image when it has loaded and drag the mouse so that you can take a panoramic tour of the image (and the site). It is also now possible now to locate the panorama with Google maps. Thanks to Chuck Jones for the information that you can now register to receive e-mail notification when Abzu is updated. Direct your browser to http://www.rssfwd.com/ , enter the url: http://www.etana.org/abzu/rss/ , and then your email address and you're done. For those of you unfamiliar with Abzu, "Abzu is a guide to the rapidly increasing, and widely distributed data relevant to the study and public presentation of the Ancient Near East via the Internet." Jimmy Dunn has updated the Tour Egypt website with news about a new ranking system for hotels in Egypt, enabling tourists to make more informed decisions about facilities and services that will best meet their needs: "The Minister of Tourism has issued a ministerial decree adopting new regulations for the classification of hotels in Egypt. These regulations were set by a committee consisting of tourism experts under the direction of Mr. Fathi Nour, Chairman of the Egyptian Hotel Association and Consultant to the Minister of Tourism, with the participation of private sector hotel experts and Mr. Ahmed El Nahas, Chairman of the Egyptian Tourism Federation, an international hotel expert. . . . The new classification system has introduced, for the first time in the Middle East and Africa, a system of assessment in two phases. The first deals with the infrastructure, equipment, appliances and tools available within the hotel. The second specifically addresses the quality of service, which is carried out through an evaluation system using 'Mystery Shoppers', an internationally recognized practice where reviewers make undeclared visits to hotels." "Governments must realize that the greenhouse effect is damaging world heritage monuments such as the Parthenon, climatology experts said at the International Conference on Climate currently under way in Nairobi. Climate change is a grave threat to some of the greatest world heritage monuments, from Darwin’s favorite coral reef in Belize to the archaeological treasures of Scotland. . . . .Egypt is also at risk. Coastal erosion and flooding in the Nile Delta pose a risk to the monuments of Alexandria". Please can anyone email or post a comment if you know when and where the third installment of this conference is to be held (possibly announced at the end of the Lisbon meeting). "Egypt is going to have a new museum. The Arab country is building, in Al-Azhar Park, in Cairo, a museum that will retrieve the history and religion of the capital city of the Arab country. It will be named First Museum of the City, and will convey a notion of the evolution of the city. The museum will be in an area of 4,000 square metres, and will have two floors, on which 1,000 pieces from different historical periods, especially the Islamic one, will be exhibited. . . . The committee in charge of the project is still searching the country for objects to be exhibited in the museum. Some of them will come from other museums. The Pharaonic pieces will come mostly from archaeological excavations in the Matarya region, in the outskirts of Cairo. Objects coming from excavations at the Citadel, a historical area in the Egyptian capital, will be exhibited in the museum as well. According to Abdel-Khaleq Mokhtar, general director for monuments in southern Cairo, the founding of the museum serves the purpose of showing the urban and cultural development of Cairo throughout the centuries. The museum will provide visitors with informative, educational and ludic data on the city." "The BBC's Egypt relives the bitter rivalry between Britain and France. . . . The desperate military, political and scholarly competition between the two European powers plays a large role in the six-part dramatised documentary series Egypt, which Bradshaw produced for the BBC. The series devotes two episodes to each of three stories: Howard Carter's discovery of the tomb of Tutankhamen; Italian Giovanni Belzoni's explorations of southern Egypt on behalf of the British; and the race between the finest minds of Britain and France to unlock the secrets of the hieroglyphs." "The stories of Howard Carter, who made one of the greatest ever archaeological finds when he discovered Tutankhamen’s intact tomb, circus strongman and adventurer Giovanni Belzoni, who unearthed the 3000-year-old monuments of Rameses II, and Jean-Francois Champollion, who cracked the code of the hieroglyphs via the Rosetta Stone, are revealed in the handsome six-part documentary drama Egypt, which began on Seven and GWN last Sunday. Series producer Paul Bradshaw says the stories were so compelling that they derailed original plans for a series focused purely on ancient history. Instead, Egypt became a fully dramatised account of the men behind these critical discoveries." "The boy king is still the man. With about six weeks to go before its Jan. 1 departure from Chicago's Field Museum, "Tutankhamun and the Golden Age of the Pharaohs" seems to be surpassing the museum's expectations. Though it hasn't reincarnated the craze -- and probably won't top the attendance -- of the first Tut show here in 1977, it has been a very respectable sequel. According to the Field:From the show's opening May 26 through last Sunday, 868,812 Tut tickets of all types have been sold. The Field projects it will sell around 1 million tickets before the show's seven-month run ends, which would be a new record for a ticketed exhibition there. Admission was free for the first Tut show, which ran for four months in 1977 and drew 1.36 million visitors -- an attendance total the current show likely won't reach because it has had relatively few free admissions." "Frustrated by the J. Paul Getty Trust's refusal to return a prized statue of Aphrodite and a score of other antiquities, Italian officials are threatening to impose an unprecedented 'cultural embargo' on the Los Angeles museum that would prevent its borrowing any artwork from or conducting research in their country. The impasse in talks came as new evidence was submitted Friday in the criminal trial of the Getty's former antiquities curator that the museum chose not to pursue information about the Aphrodite statue's origins when presented with an opportunity a decade ago." "The Egypt Centre at Swansea University will say goodbye to one of Ancient Egypt's most mysterious artefacts next week, when the Rhind Mathematical Papyrus is returned to its permanent home at the British Museum .A section of the famous Rhind has formed the centrepiece of a year-long exhibition at the Egypt Centre, after it was loaned to the museum under the British Museum 's Partnership Scheme.Visitors to the centre, where entry is free of charge, will have a last chance to see perhaps the most famous of the British Museum's magnificent collection of Egyptian papyri until Tuesday 21 November. The Rhind was originally a roll 513cm long by 32cm high and came from an unknown site in ancient Thebes , now Luxor .Beginning with the rather grandiose introduction, Accurate reckoning. The entrance into the knowledge of all existing things and all obscure secrets, the text consists of 84 mathematical problems, which concern the doubling of odd-numbered unit fractions relating to commerce. The Greeks were still using the same system 2000 years later." Another review of the Holy Image, Hallowed Ground exhibition, which opened at the Getty yesterday, accompanied by a photograph of the lovely 6th century icon of Saint Peter the Apostle: "In the shadow of the rugged Mount Sinai in Egypt lies Saint Catherine's, the world’s oldest continuously operating Christian monastery, established in the sixth century. Artistic treasures from this ancient site will travel to Los Angeles for Holy Image, Hallowed Ground: Icons from Sinai, at the J. Paul Getty Museum, the Getty Center, November 14, 2006–March 4, 2007. The exhibition offers an unprecedented look at some of the oldest surviving icons from the Byzantine world, and provides rare insight into monastic life, past and present, at the remote, historic monastery." An article on the Kenya Times, in a miniscule font, summarizing the current state of speculation about the death of Tutankhamun: "If there is one Pharaoh who is most famous and has elicited the world’s interest in Egyptology, then undoubtedly, King Tutankhamun stands out. Tutankhamun ruled between 1361-1352 BC in the 18th dynasty of the new kingdom of ancient Egypt. When Egyptologists Lord Carnavon and Howard Carter tumbled on this young boy-King’s tomb in the Valley of kings next to Ramses VI’s tomb in 1922, the body had for three thousand years lay there in an anthropoid coffin of solid gold, besides it strange animal statutes, inscriptions and ushabti figures. Jesus had been born and died, Mohammed too, so much had happened while Tut, as he was fondly referred, lay there untouched, un-interfered with and as it was, closed to the world. Since then, Egyptologists have been baying to establish the real cause of the young King’s death ever since a close examination of his mummy revealed an evidence of injury on his head. It could have been a result of an accident but suggestions of murder most foul have also been floated. An X-ray scan revealed a dense spot at the lower back of the skull, potentially a chronic subdural haematoma, which could have been caused by a blow from behind. Last year, Egyptian archeologist Zahi Hawass revealed the results of a CT scan performed on the Pharaoh’s mummy which uncovered no evidence for a blow to the back of the head as well as evidence suggesting foul play." As I posted yesterday, I'm back in the UK after a terrific week away with some really great people, visiting some parts of Egypt that I have never been lucky enough to experience before. I will post the photographs online when I have finished editing them (there are a couple of thousand - it may take some time!). Sorry the update was a bit late - it took me longer than usual to go plough through emails and websites to update the blog retrospectively. You'll find all the news items dating from (and including) 4th November below. You may need to go into the archive to go back to the November 4th items. If I've missed any news items that you've noticed elsewhere, please let me know so that I can plug the gap. Special thanks to Kat Newkirk for all the forwarded news items - Kat, you're a star. Also, many thanks to everyone who emailed for the welcome home! Much appreciated. "In the first years following Alexander’s death, Ptolemy (like the other so-called Successors) continued to mint the traditional coinage that had been issued by his hero. The main type of coin had shown Alexander’s putative ancestor Herakles (Hercules) wearing on his head the lion scalp that commemorated one of his legendary labors. It was, after all, normal Greek practice to reserve the “heads” side of a coin for the portrait of just such a god or goddess: Athena at Athens, Persephone at Syracuse, Helios at Rhodes and so forth. Then Ptolemy dared take a step that has stirred no end of debate among scholars—one that, in essence, threw a rock into the still waters of Greek art and religion, sending great ripples outward through time and place to Sicily, Syria, Rome and beyond: Ptolemy replaced the portrait of Herakles on Alexander’s posthumous coinage with a stunning image of another god—Alexander himself." See the above page (the second link) for the full story. The Daily Star is featuring photographs from the collection of The Arab Image Foundation over the next few weeks. This is a lovely photograph of tourism, complete with camel rides, in 1902: "The Great Pyramids of Giza have been a major tourist attraction for centuries. A group of visitors pose by the World Wonder at the turn of the 20th century, in 1902, in this photography by Selim Abou Izzedin. While Egyptian society has undergone a dramatic transformation since this photograph was taken, the national landmark remains relatively unchanged. Visitors, past and present, enjoy camel and horse rides at the foot of the pyramids." See the above page for the photograph and text. I would be eternally grateful to anyone who could give me the GPS co-ordinates for Winkler's Site 18 in the Eastern Desert - not the one's shown in David Rohls's Followers of Horus, but any other independent readings. "Seeking a place where no other gods were held sacred, Akhenaten moved the capital of the Egyptian kingdom from its traditional seat at Thebes to a spot on the eastern bank of the Nile River, where he built the city now known as Amarna - and moved 20,000 people there - in about 12 years. Stone statues and reliefs at the heart of the exhibit reflect the changes Akhenaten imposed on Egyptian society. Trumpeting a religion that for the first time in recorded history relied on the belief in a single god, Akhenaten strove to turn his monotheistic subjects to the worship of the Aten - the sun disc. . . . As a result, temple architecture under Akhenaten changed because the buildings no longer had to accommodate three-dimensional renderings of the gods. Art took on more naturalistic, curved lines, as can be seen in the full-figured, if headless, statue of a princess on display." "esides the Amarna exhibition, the museum's Upper and Lower Egyptian galleries have gotten a face-lift, so the continuing exhibits of mummies and the like have upgraded space and interpretation. The Amarna exhibition is an appetizer for the highly anticipated show Tutankhamun and the Golden Age of the Pharoahs, coming in February from Egypt to the Franklin Institute Science Museum. " "Hofstetter, one of the world's best-known light artists, transforms buildings, monuments and natural beauty spots into contemporary works of art. His masterpieces include projections of polar bears on icebergs and Swiss crosses on the Matterhorn and government buildings. . . . The tireless globetrotter is just back from a trip to Egypt where he and his team lit up the Giza pyramids and sphinx for a local hotel chain. 'Six days, 12 hours of sleep, jeeps, helicopters and permits. The fact that it happened; I can't find the words,' he declares, his eyes sparkling. 'My ideas help them put across their ideas. They want to stop people going into the pyramids and damaging them. I gave them the idea that by illuminating the graves on the outside of the pyramids people don't need to go inside.' "
The latest issue features an article about Kush (September 2006 issue, but only recently updated on the CA website): " In the late Kushite period, from the 3rd century BC to the 4th century AD, the Kushites (almost) rivalled Egypt, and at Dangeil a fine temple to Amun is being excavated by Julie Anderson and Salah Mohamed Ahmed. Here they tell how they are uncovering a city steeped in ritual, bolstered by monumental architecture, and inhabited by a people with a surprisingly strong penchant for baked bread." "Tourism promoters are hoping that after their next advertising campaign, even Tut, the boy king, will know Philly's more fun when you sleep over. The Greater Philadelphia Tourism Marketing Corp. says it's equipped with $1 million in grants from the state to promote "Tutankhamun and the Golden Age of the Pharaohs," opening Feb. 3 at the Franklin Institute, to attract people from outside the region. . . . The traveling exhibition, which will make the last of four U.S. stops here, could draw more than a million people, officials said. Already, the museum has sold more than 200,000 advance tickets, with 94 percent bought by people from outside the region. At the full price of $27.50, that would mean the show has sold about $5.5 million in tickets." "Last week's EEF News Digest is online at the above address, for all the latest information about exhibitions, conferences, lectures and new online and print publications, grants awards and fellowships, new websites, courses and trips, plus a round up of last week's main news items." Jane Akshar has updated her Luxor News Blog with a summary of a recent lecture at the Mummification Museum in Luxor. Dr Silvia Einaudi lectured on the theme of Researches in the tombs of Harwa TT37 and Pabasa TT279 on the 12th November 2006: "Harwa lived around 700-680 BC in the reign of Shabita and Tarhaqa 25th Dynasty. There are 8 statues of Harwa known 3 cubic or block statues, one of him with his parents, one with 2 goddesses and three Old Kingdom seated scribe styles, only one of which has a head but this is quite clearly a portrait. His title was Great Steward (Butler) of the Divine Adoritist. His tomb is situated in the middle of the Assasaif area, built on the processional way of Mentuhotep, with an entrance at the south. At the time his tomb was built the processional way of Hatshepsut’s temple was still being used for the Beautiful Feast of the Valley. It is between the tombs of Montumonet and petamenophis." Article about a new exhibition opening soon in the National Gallery of Australia, Egyptian Antiquities from the Louvre: Journey to the Afterlife, based on an interview with co-ordinating curator Bronwyn Campbell: "Campbell expects the new exhibition to attract large crowds, larger even than the 100,000 who went to see the gallery's popular Constable show last summer. And that's despite the fact the Australian Museum hosted its own imported blockbuster - Life Beyond the Tomb: Death in Ancient Egypt - just 12 months ago. . . . In all, 302 objects - from sarcophagus and sculpture to jewellery - will be on display in Canberra. They were chosen by Marc Etienne, the curator of the Louvre's Department of Egyptian Antiquities. Despite the Mona Lisa, Venus de Milo and other great wonders of the Louvre, Egyptian Antiquities is the most popular of the museum's eight departments. Yet of its 60,000 artefacts, there is room for only 5000 in the Louvre's permanent display - which is why in recent years the Louvre has taken its Egyptian collection to the world." The exhibition runs from November 17th 2006 until February 25th 2007. See the above page for the full 2-page article. This piece looks more at the relationship of France with Egypt's heritage since the 19th century, and at the collections held within the Louvre itself. N.B. - this page seems to have an intermittent problem. It loaded for me once, but failed to load on another occasion. "When two substantial books with similar titles featuring images on the cover that are almost the same are published by the same press in the space of a single year, one feels almost challenged to discover the difference between them, if only in order to guide potential readers. The Complete Temples of Ancient Egypt, published by AUC Press by arrangement with Thames and Hudson of London, is part of a series of book put out by the latter publisher. Already on the market are The Complete Gods and Goddesses, The Complete Royal Families, The Complete Tutankhamun, and The Complete Valley of the Kings. This new addition is of the same excellent quality as the rest of the series, and it includes the most famous monuments in Luxor and every temple along the Nile. It covers temple construction and decoration, explains the function and meaning of each part of the temple, as well as the religious rites and roles of pharaohs and priests. Fact files, tables, newly commissioned perspective views, and a guide to visiting the major sites are included." "The Field Museum in Chicago, where Tutankhamun and the Golden Age of the Pharaohs is on view through Jan. 1, is extending its hours for the holidays, providing not only more viewing time at the blockbuster show but also more time for shopping. Through the end of the year, the museum will open one hour earlier (8 a.m.) on Saturdays and Sundays." See the above page for details of the opening times. The first issue (Autumn 2006) of a new academic journal, The Papers of the Institute of Archaeology and Antiquity from the University of Birmingham, is now online. "The Rosetta journal is aimed at postgraduates and professionals from a variety of historical and archaeological disciplines. Within Rosetta you will find articles covering a wide scope of archaeology, history and classics subjects, book reviews, museum and conference reports. There will also be the opportunity to respond to articles in the forthcoming 'forum' section, and links to other sites of interest." There's nothing Egyptological in this issue, but I thought it worth highlighting that the journal exists, for future reference. Amended entrance fees for sites in Alexandria are listed on Zahraa Adel Awed's Alexandria News Blog at the above address. 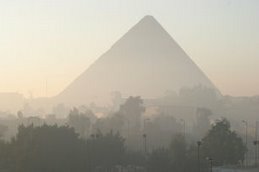 "All-About-Egypt is a travel guide website designed for people interested in Egypt as a vacation destination. The site delivers all the necessary information for Egypt travelers such as passport and visa requirements, main tour attractions, hotels, restaurants, transportation shopping and currency exchange. It also contains interesting facts about ancient Egypt magnificent temples, exquisite art and its glorious past, which continues to be the most powerful magnet for visitors to Egypt." See the above page for the rest of this short summary. A short and somewhat dubious article from Al Ahram (since when was Serabit Al-Khadem in both the Nile Valley and Sinai at one and the same time?). But here it is anyway: "Miners were the very first settlers in Sinai. Around 8,000 years ago they started mining near-surface turquoise and copper. By 3500 BC, the goliath turquoise vein of Serabit Al-Khadem was discovered and for more than 2,000 years the early Pharaohs of newly united Egypt conducted a fairly systematic operation. Turquoise was extracted from the high mountainous mines, carried down through Wadi Matalla till it reached the garrison port of Al-Markha, near today's Abu Zenima. From there it was loaded onto ships bound for mainland Egypt. The bluish green turquoise served a number of purposes, from carving scarabs to using its powder as a colouring paint. Dedicated to Hathor, the patron goddess of copper and turquoise miners, her temple is located 1,100m above sea level. It was first built during the reign of Pharaoh Sesostris I of the Middle Kingdom." See the above for the rest of the piece. "Global warming is threatening archaeological sites from Peru to Egypt as well as natural wonders such as the Caribbean's largest coral reef, a U.N. report said on Tuesday. . . . UNEP said fear of cultural losses, such as a Viking camp in Scotland at risk from erosion or rising seas threatening Alexandria in Egypt, was an extra reason for action to rein in a warming widely blamed on human use of fossil fuels." See the two-page story at the above address. "Egypt's Tutankhamen exhibition is coming to Bahrain next year. Egypt has accepted in principle Bahrain's offer to host the Golden Pharaoh display in April, Egyptian Supreme Council of Antiquities secretary-general Zahi Hawwas said yesterday. He said Bahrain would be the first country in the Arab world and North Africa to hold an exhibition of Egyptian antiquities. The exhibition will run for several months in Bahrain, he told the Egypt State Information Service. It is currently in the US, but will move to South Africa before travelling to Bahrain, said Mr Hawwas." See the above page for the remainder of this brief bulletin. "The project was inaugurated in January last year by Dr Zahi Hawass and specialist form the US and Sweden. It is expected to finish at the end of this month. The reason it was needed was that Karnak and Luxor temples, (in fact all temples in Egypt) were at risk from the rising water table. This has been caused by irrigation especially of water hungry crops like sugar cane. This means the foundations of the temples are constantly in contact with water. The capillary action within the stone draws the water up and natural evaporation causes slats to be deposited on the surface or just underneath he surface of the stone. This then crystallises below the surface of the stone and forces the stone o separate. The surface is pushed out and this causes the loss of decoration. Additionally the constant moisture itself makes the stone to revert to its original state of sand. Eventually the block itself disintegrates. This affects limestone at well as sandstone. A consortium of Egyptian, US and Swedish companies and people is addressing the problem. The Supreme Council of Antiquities is the client, it is financed by US and Sweden; SWECO project manage with the work actually being done by EGYCO." The summary is accompanied by photographs. See the above page for the full story. Penultimate article on the above page: "Controversy over what the media has dubbed the 'Citadel Towers' reached new heights last month after Minister of Culture Farouk Hosni reportedly suspended Dr. Abdallah Kamel, the director of the Islamic and Coptic antiquities’ sector. Insiders claim Hosni berated Kamel for his failure to inform the ministry that a leading businessman was building a number of high-rise buildings on the hills facing the Citadel. The question is: Why fire him now? It’s not as if the threat of high-rises so close to the Citadel hadn’t been discussed for months in Egyptian newspapers. The towers’ existence directly violates international antiquities preservation measures as they fall within the safety zone of the ancient Citadel. Under Egypt’s Antiquities Act, the Supreme Council for Authorities (SCA) has the right to halt any construction around a monument if it falls within a three-kilometer radius." This is the last bulleting on the above page: "Minister of Culture Farouk Hosni is preparing to open yet another museum this month, this time in the beautiful coastal city of Rachid, where the Rosetta Stone was discovered by the French in 1799 and translated in 1822. According to SCA head Zahi Hawass the LE 4-million, two-building complex will feature a three-floor historical construction dating back to the Ottoman era. In the 1960s, the building was turned into a small museum depicting Rachid’s role in the struggle against the British occupation. The museum will display some 700 pieces, the most important of which are Umayyad and Ottoman gold and bronze coins." This is the entire item. In the 1870s and '80s, ships carried groups of tourists to see the world's ancient wonders in Greece, Jerusalem, India, Constantinople (now Istanbul, Turkey) and especially Egypt -- all of which were known at the time as the Orient. Many photographers sold their pictures outside the ancient wonders as tourist souvenirs. They weren't called photos but views, which is how the View-Master toy got its name and conjures up the notion of a special hidden sight, a seemingly three-dimensional image leaping out of the frame. And the subject matter was just as compelling, offering average Americans glimpses of other cultures that they could take home and keep -- art for the masses. . . . The Portland Art Museum's permanent collection includes about 150 photos from this era by some of the most celebrated photographers of their day, including J. Pascal Sebah. Sebah first made his name in Constantinople with views of ancient ruins, portraits and local people in traditional dress. In 1873 he opened his first studio branch in Egypt, and that's when his career accelerated." "There are images that stand out in every art exhibit. In the Portland Art Museum's exhibit The Quest for Immortality: Treasures of Ancient Egypt, it may be one of the smaller objects, a statue of the goddess Isis -- as pristine as if it had been carved yesterday, not in the 26th dynasty, 664-525 B.C. Seated on a throne, serenely looking ahead above the level of any mortal, she is delicately crafted, with smooth surfaces and fine detailing. You have to shake yourself to remember that many of these works have endured for 3,500 years, from a civilization that lasted for 3,000 years. Some of the objects in this exhibit were new when the pyramids already were 1,000 years old." "Before a single ticket is sold for "The Quest for Immortality: Treasures of Ancient Egypt" at the Portland Art Museum, staffers had to clear a series of hurdles nearly as long as the Nile. (OK, maybe not quite that long). First, Portland had to compete with several other museums to host the show, which began at the National Gallery of Art in Washington, D.C., one of its organizers. The five-year, 11-city tour of the United States includes Boston, Houston and Denver; Portland is the only West Coast stop. . . . .Moving and construction for the traveling Quest for Immortality exhibit is overseen by an Egyptian curator designated by the Supreme Council of Antiquities in Cairo, as well as representatives from United Exhibits Group of Copenhagen, Denmark, a show organizer. And lots of Portland Art Museum employees will help once the crates arrive. But only a select few have license to touch any of the objects." Minerva Magazine's latest edition features an article called Roman Amheida: Excavating A Town in Egypt’s Dakhleh Oasis by Roger S. Bagnall, Paola Davoli, Olaf E. Kaper & Helen Whitehouse. For the full contents listing see the above page. "Modern Cairo is a city of 18-million people. Like many large cities, residents enjoy the conveniences of technology and availability of culture and nightlife, but struggle with dense gridlock and small spaces. There is something that clearly distinguishes Egypt's Capital as a unique Metropolis. The sprawling city is a backdrop to one of the most recognizable images in the world the Giza Pyramids. . . . Luxor is nearly 400 miles south of Cairo. Its simplicity is a stark contrast to the capital city. Many residents don't even have running water. The parched mountains of sand and rock have not seen rain since 1994." An article accompanied by a video report about the investigations into a mummy nick-named Annie, originally from Akhmim (c.300 miles south of Cairo), dating to between 300 and 200BC: "Back in April, Annie was taken from the Academy of Natural Sciences to Hahnemann Hospital. Without disturbing Annie's wrappings, she was given a CT scan. These images were then sent to a laboratory to produce a skull model. Now, forensic sculptor Frank Bender will start facial reconstruction." The 1931 Walt Disney classic animation 'Silly Symphonies - Egyptian Melodies' can be seen at the above URL on YouTube. I'd never seen it before, and it is really quite charming. A spider, making a web at the side of the Great Sphinx travels into the Sphinx via a gate betweeen its front legs, and finds itself traveling to a tomb full of mummies who come to life and have a party. It is in black and white.